Dior women's watch is Piece Unique.Recently the company Dior delighted his fans another novelty. Recently the company Dior delighted his fans another novelty. New women’s watches Dior Piece Unique, harmoniously combining the basic features of products Dior, such as the characteristics of the rotor, dial gauge and straps – a real gift for women who love bright and flashy accessories. The basis of new watches – automatic mechanisms Elite Zenith factory production with a reserve of 50 hours. Functions: hours, minutes, seconds. Water-resistant models – 50 meters. Hours are represented in the case of gold, with original dial and bezel wrought, inlaid with precious stones cut baguette. Case Diameter – 33 mm. The rear housing cover – clear. A distinctive feature of Dior innovations include the rotor and the beautiful mother of pearl inserts on the strap and dial, the use of precious stones that each model of the new line passed a special character and mood. Watches are equipped with a strap taffeta or satin, tulle or natural corrugated alligatorovoy skin to choose from. Velcro straps are equipped with the unfolding of white gold. Model Dior Piece Unique n ° 6 using different shades of red, from bright red to garnet-red color, underlined. For the inlay of this model used spineli (crystalline rock rubies pale red color) and baguette-cut rubies, which are framed in black face, giving it a bold and eye-catching look. Watch case is made of white gold with diamonds. Watch Dior Piece Unique n ° 7 different use of dark blue sapphires, giving hours of solid elegance, and the snow-rimmed blue pearl, inlaid with diamonds. 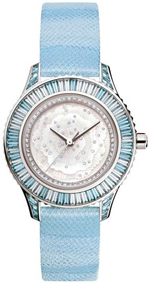 Ladies Watches Dior Piece Unique n ° 8 are made with white mother of pearl, which is combined with diamonds and aquamarines five different shapes, making the model look weightless and easy. 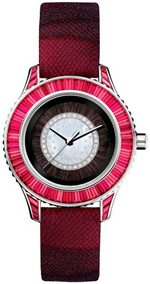 The original clock Dior Piece Unique n ° 10 in pastel shades, which are interspersed with purple amethysts and diamonds, pink mother of pearl dial and agate. 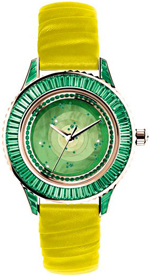 Ladies Watches Dior Piece Unique n ° 11 – fans will be thrilled with the bright colors. Watch stunning diamond encrusted yellow and green colors, as well as sapphires and emeralds. Model Dior Piece Unique n ° 12 is allocated among the other using one of the most popular combinations Dior turquoise dial, decorated with yellow and white diamonds, and bezel, decorated with pink sapphires. 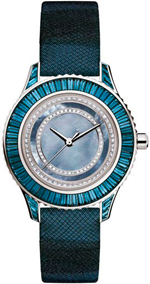 Women’s Watches Dior Piece Unique n ° 13 are made in harmony range of shades of blue sapphires and emeralds are green, accented pearl dial. Design models Dior Piece Unique n ° 14 is decorated in a contrasting combination of “ice” and “flame”: pearl dial with smoky quartz crystals and diamonds, garnets and white with brown strap. The latest model of the new series – watch Dior Piece Unique n ° 15 can be called the epitome of tenderness and freshness of color, which is achieved by using a pale pink, green and white colors beautiful tourmalines and sapphires. Buy watches Dior Piece Unique can have official representatives of the company.